If you were surprised to see the name Charlotte Rampling in this year’s Oscar nominees, 45 Years will justify that recognition in a hurry. 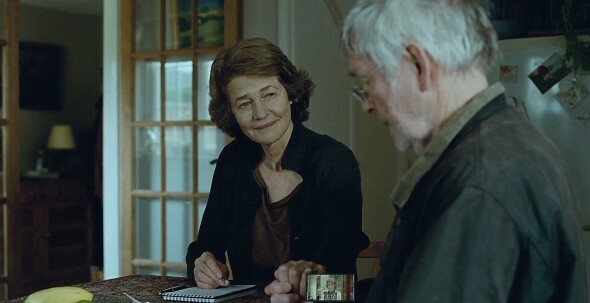 It only takes a few scenes before you realize the subtle depth Rampling brings to her role as Kate Mercer, a woman on the verge of celebrating 45 years of marriage to her husband, Geoff (Tom Courtenay). As their big anniversary party approaches, a bombshell piece of news gets dropped. Swiss authorities have recovered the body of Geoff’s old girlfriend Katya, five decades after she fell into a crevasse while the two were hiking. Though plans for the party move forward, the couple struggles with the effects of this sudden revelation. Writer/director Andrew Haigh adapts David Constantine’s short story with elegance and restraint. Secrets are at work here, but they have nothing to do with Katya’s accident. What Haigh is after isn’t nearly as easy to define or resolve. What bonds two people together for a lifetime? How easily can those bonds be shaken to the core? Rampling and Courtenay are simple perfection, creating a lived-in chemistry that is utterly authentic. There is never a doubt that their characters have built their lives together, and the actors bring the gravitas that often renders dialog unnecessary. Half-hearted smiles and brief glances can be deafening, and Haigh confidently allows these small moments the space they need to cut deep. Kate can “smell Katya’s perfume in every room,” and the curiosity about her husband’s former life begins to alter Kate’s perception of her entire marriage, just as that marriage is set to be celebrated for its success. Rampling may indeed deliver the finest performance of her illustrious career. Ultimately, she is the conduit for making the couples’ intimate details resonate on a universal level, and she does it with deceptive ease. 45 Years may speak softly, but it compels you to listen hard, and sends you home from the party with a shattering final shot that may not leave your head for days.